SALANDRA, ITALY -- (MARKET WIRE) -- September 12, 2005 -- Universal Communication Systems, Inc. (OTC BB: UCSY) subsidiary Millennium Electric T.O.U. Limited company President & CEO, Mr. Ami Elazari, today issued the following statement: "I am pleased to announce that we have concluded our negotiations, signed an agreement and have entered into a major Joint Venture agreement with Restruttura S.L.R., a local, well-established Italian company operating in the field of energy. The transaction calls for the establishment and erection of a 1000 kW, grid-connected PV system using our Millennium brand, state-of-the-art photovoltaic technology." Our agreement calls for an initial payment of USD$242,000 for the first phase that is to be installed and total of USD$6.5 million for the entire project which will be concluded in about 18 months. Under the terms of the agreement, Millennium Electric T.O.U. Limited will install a 1 Mega Watt Solar Power station using Millennium brand 160-watt photovoltaic panels, connected to the Italian grid and capable of producing 1,500,000 kWh annually. According to plans, the operation is to receive EU$0.50 for each kWh of electric energy that will be sold back to the local Italian Electric grid. Mr. Ami Elazari, President and CEO of Millennium Electric, went on to state: "This JV agreement that we have concluded here in Italy is part of the basic Millennium and UCSY strategy, namely to obtain and establish a major foothold in select countries worldwide. We believe that we have found a very good industry partner in Italy and a partner that will be instrumental in helping us build our global markets. The market for Photovoltaic Solar Energy products and services continues to grow very fast, and we plan to grow our market share, in this ever expanding multi-billion dollar industry." Mr. D'Alessandro, CEO of Resstruttura, issued the following statement: "We are very happy to work in cooperation with Millennium Electric and utilize their unique technologies in photovoltaic while introducing them into the Italian market. This 1000 kW grid-connected power station is just the first of many more to come". 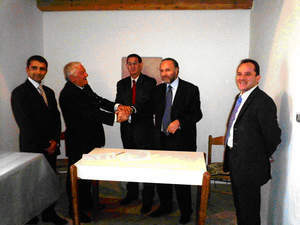 The agreement was executed in the presence of the Israeli Ambassador to Italy, Mr. Ehud Gold, and Mr. Mordechai Rodgold, the Head Economic Attache. About Universal Communication Systems Inc. This document includes certain forward-looking statements within the meaning of the Private Securities Litigation Reform Act of 1995. These statements are based on management's current expectations or beliefs, and are subject to uncertainty and changes in circumstances. Actual results may vary materially from those expressed or implied by the statements herein due to changes in economic, business, competitive, technological and/or regulatory factors, and factors affecting the integration of the businesses of Universal Communication Systems, Inc.
More detailed information about these factors may be found in filings by Universal Communication Systems, Inc. with the Securities and Exchange Commission, including their most recent annual reports on Form 10-KSB and quarterly reports on Form 10-QSB. Universal Communication Systems, Inc. is under no obligation to, and expressly disclaims any such obligation to, update or alter their forward-looking statements, whether as a result of new information, future events, or otherwise.